Biotinylated Human LAP (TGF-beta 1), His Tag, Avi Tag (LAP-H82Q6) is expressed from human 293 cells (HEK293). It contains AA Leu 30 - Arg 278 (Accession # P01137-1 (C33S)). The protein has a calculated MW of 32.2 kDa. The protein migrates as 45-55 kDa under reducing (R) condition (SDS-PAGE) due to glycosylation. 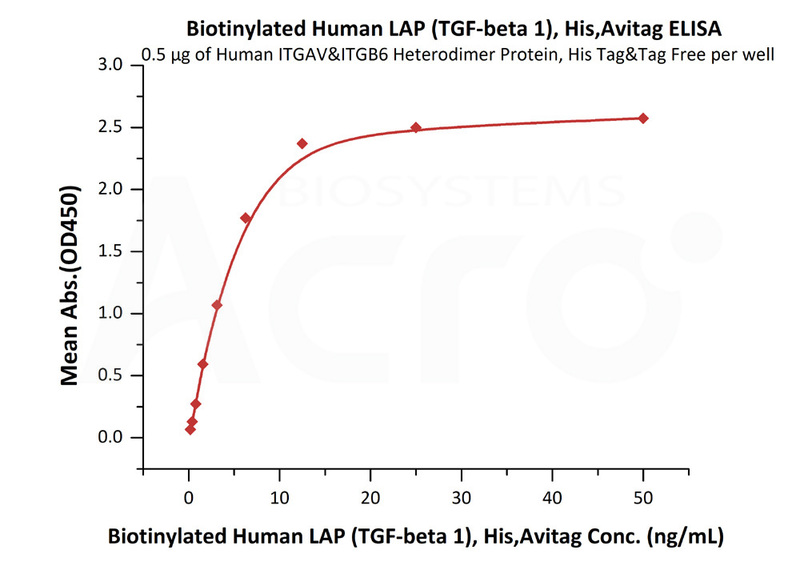 Biotinylated Human LAP (TGF-beta 1), His Tag, Avi Tag on SDS-PAGE under reducing (R) condition. The gel was stained overnight with Coomassie Blue. The purity of the protein is greater than 90%. 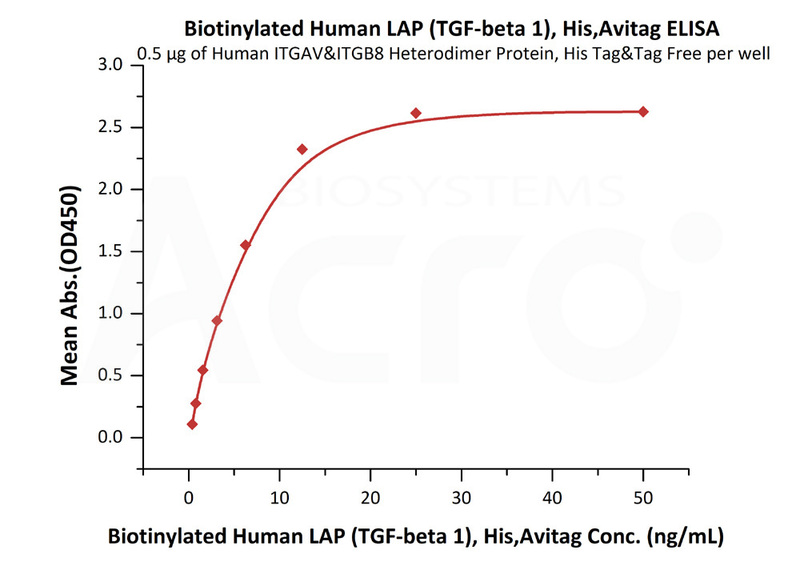 Immobilized Human ITGAV&ITGB6, His Tag at 5 μg/mL (100 μL/well)can bind Biotinylated Human LAP (TGF-beta 1), His Tag, Avi Tag (Cat. No. LAP-H82Q6) with a linear range of 0.4-6 ng/mL (QC tested). Immobilized Human ITGAV & ITGB8 Heterodimer Protein (Cat. No. 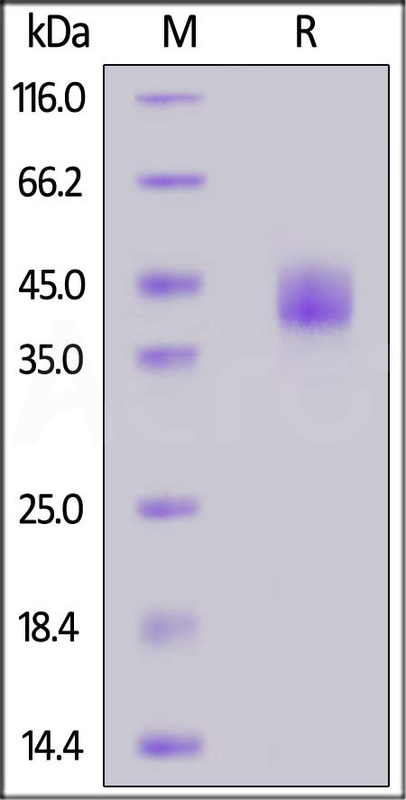 IT8-H52W4) at 5 μg/mL (100 μL/well)can bind Biotinylated Human LAP (TGF-beta 1), His Tag, Avi Tag (Cat. No. LAP-H82Q6) with a linear range of 0.4-6 ng/mL (Routinely tested). Transforming growth factor beta 1 ( TGFB1) is also known as TGF-β1, CED, DPD1, TGFB. is a polypeptide member of the transforming growth factor beta superfamily of cytokines. It is a secreted protein that performs many cellular functions, including the control of cell growth, cell proliferation, cell differentiation and apoptosis. The TGFB1 protein helps control the growth and division (proliferation) of cells, the process by which cells mature to carry out specific functions (differentiation), cell movement (motility), and the self-destruction of cells (apoptosis). The TGFB1 protein is found throughout the body and plays a role in development before birth, the formation of blood vessels, the regulation of muscle tissue and body fat development, wound healing, and immune system function. TGFB1 is particularly abundant in tissues that make up the skeleton, where it helps regulate bone growth, and in the intricate lattice that forms in the spaces between cells (the extracellular matrix). Within cells, this protein is turned off (inactive) until it receives a chemical signal to become active. TGFB1 plays an important role in controlling the immune system, and shows different activities on different types of cell, or cells at different developmental stages. Most immune cells (or leukocytes) secrete TGFB1. TGFB1 has been shown to interact with TGF beta receptor 1, LTBP1, YWHAE, EIF3I and Decorin. (1) Ghadami M, et al., 2000, Am. J. Hum. Genet. 66 (1): 143–7. (2) Assoian R, et al., 1983, J Biol Chem , 258 (11): 7155–60. (3) Derynck R, et al., 1985, Nature 316 (6030): 701–5. (4) Letterio J, Roberts A, 1998, Annu Rev Immunol 16: 137–61.